I had a church finance board meeting one night this week. To be honest, these meetings have been difficult lately. I get it – it is important to responsibly manage the funds of our church. That light bill needs to be paid every month! But during our long meetings (often held after a full day of playing with numbers at work) I struggle to remember how this conversation is advancing God’s work in the world. On this particular week I was selected to prepare devotions for the meeting. Distracted by other things, I waited until the last minute. Late that afternoon, I read a passage from a daily devotional about trust. If we practice trusting God with little things it will be easier to rely on God when storms come; easier to live this crazy life knowing God’s Peace is near! At the meeting, I read the devotion and shared Psalm 56 with the group. I acknowledged my own anxiety and how my inability to trust God makes me weak. I declared that as Church, and as members of a body of leaders in this church, we are called to trust God. This is especially true for a board tasked with monitoring the financial status of a church – it is easy for us to be consumed by anxiety, failing to trust God’s work in our midst! I closed in prayer and the meeting proceeded. I dutifully took minutes and left the building 2 hours later, unable to declare that my anxiety throughout this meeting was in any way diminished by deepened trust in God. I drove to work, consumed by stress from this meeting, guilt-ridden by another night away from home, and stressed by the quantity of work waiting on my desk. Oh, how quickly I had forgotten my own guidance to trust God! As the downtown skyline appeared, I stared at this office building where I would spend the rest of my night. I tried to pray, over and over…. God, remind me of your presence, bring me your peace, help me to trust that you are with me despite my anxiety! As I re-read this verse late that night in my office, I felt I was being trampled by myself! I felt oppressed by my own anxiety and my own inability to trust God at work in my life, even amidst stress and busy-ness. I am the attacker! Unfortunately, I see this anxiety fester in my 8-year-old. 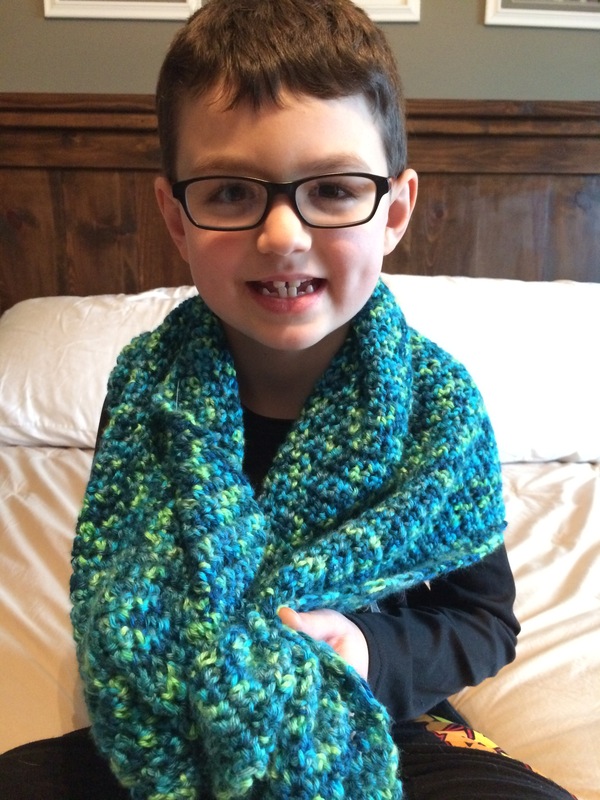 I spent over a year crocheting off and on, creating a prayer shawl for my son. I was finally able to give it to him last fall. He leaves it by his bed. Sometimes at night when we are cuddled close and talking about life, he will express fear and worry. I wrap this shawl around both of us and we pray together; we pray that God would bring us peace and comfort, and be present with us at all times. Together, we practice trust. I need these reminders to trust God as I battle a life-long burden of anxiety! I am thankful for Psalms, prayers and time for reflection which draw me near to God; which guide me to trust! Categories: God at Work, Prayer | Tags: busy, faith, God, life, meetings, parenting, peace, prayer, stress, trust | Permalink. I just watched a really neat movie called Greater about trusting God. It’s a true story about a football player and his life. It would be a good one even for the family to watch. We all need those reminders to trust that God is with us at all times. I agree it’s hard to remember that in times of stress and anxiety though! Thanks for the reminder. Thanks for the recommendation! I have not heard of that movie. The world is filled with things that create doubt. Sticking with community is a wonderful way to keep those reminders present. Thank you for the comment!!! Beautifully stated. It is very difficult to turn your worries to God. Your blog is ministry in action. Thanks!! !